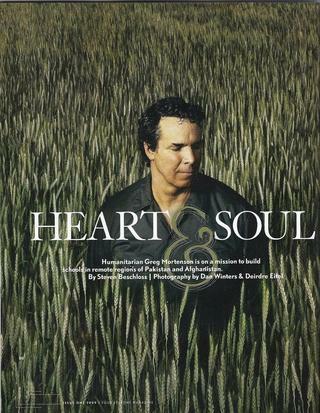 Greg Mortenson married his wife six days after they met. He entrusted his fate to warring tribal leaders in Afghanistan, men who would be shooting at each other if he were not there. He has witnessed extreme poverty and fierce brutality, yet considers himself an eternal optimist and believes that paradise is on Earth. Since 1993, Mortenson has engaged in a struggle to build nearly 80 schools in some of the most remote and dangerous spots on the planet. He’s endured an eight-day kidnapping by the Taliban and suffered death threats from fellow Americans who condemned him for “helping Muslims.” He’s said goodbye to his young family for painfully long missions in Pakistan and Afghanistan, without any certainty that he will return. And he’s co-authored a publishing sensation, Three Cups of Tea, which has been on The New York Times paperback best-seller list for more than 130 straight weeks—creating a thunderous clamour from a growing legion of fans hungry for a piece of this newly minted humanitarian rock star. So it would be understandable if Mortenson were more cut off, more reluctant to make such strong personal contact. No, what strikes you first about this 51-year-old boyish former K2 mountaineer is his deep kindness and unusual openness. But it’s exactly this heartfelt openness that has made the seemingly impossible possible and secured him the most valuable role of peacemaker. In his inspiring quest to increase literacy, reduce poverty, empower women and plant seeds of hope in places long ignored, Mortenson takes the time to sit down, drink tea, build relationships, blend in—and earn trust.